Oliver Twist may have asked for more, but with its Royale 370 Sport Fisher, Oliver Marine has served up a satisfying helping. Greg Adam reports. Admittedly, that’s hardly a surprise when you consider that Willie Oliver began building boats way back in 1934. His son John continued the tradition that today is in the hands of his son, George, the company’s current master designer. Three generations worth of experience tends to count to for a lot in this business. Yet the Tauranga-based company has another – shall we say, more sociable – secret to its success: its customers. "We listen to what they say," says sales manager Graeme Doak. "Many of our ideas come from our customers. If we make it work, we can offer it as a standard option – it’s a benefit for everyone." Indeed, prospective owners can tour the factory and discuss with those actually building their boat any ideas or concerns they may have. "That was one of the things that impressed me most," agrees Oliver boat owner Ian Kohler. "It’s obvious that they speak to people and listen. It was a real pleasurable experience." In fact, it was Kohler who came up with idea for a glass screen, complete with wiper, at the front of the flybridge. The idea’s since been taken one step further with moulded glass wrapped around the entire flybridge – and the company’s now looking at offering this as a standard feature. Unlike other models in the Oliver range that are evolutions from previous designs – such as the 390 from the 400 – the 370 is pitched as all new. In reality, though, it’s a "little sister" of the 400. It has the same beam and similar cabin and saloon layouts, but is three feet shorter overall. 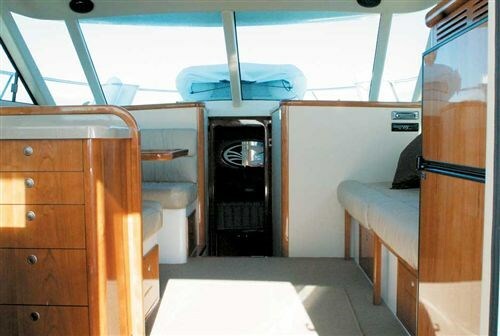 The interior space is similar, but the flybridge is noticeably smaller. The 370 measures 39’ 7" (12.05 metres) overall, including swim platform and bow roller, with a 13’ 6" beam (4.15 metres). The actual length of the hull is 37’ 7" (11.45 metres) so it fits snugly into a 12-metre berth. 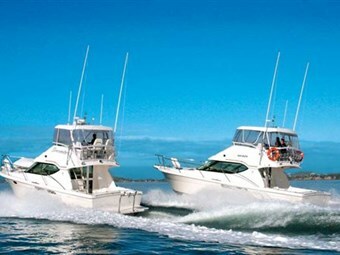 Based on the 400’s successful design, the hull is high quality (it comes with a 10-year structural warranty) and made tough for New Zealand conditions – as well as to meet New Zealand Marine Safety Authority (MSA) standards. It’s solid, hand-laid GPR laminate incorporates a layer of Kevlar from chine to chine, for strength and impact resistance. The first layer of fibreglass is laid down with vinylester resin for added strength; the fibreglass resin is isothalic, a high-grade polyester, which offers higher structural strengths over the orthothalic resins. Three water-tight compartments and collision bulkheads are built-in into the hull. In brilliant winter sunshine out on the Hauraki Gulf, the 370 certainly looked the part when we trialled it last month – and showed performance to match. 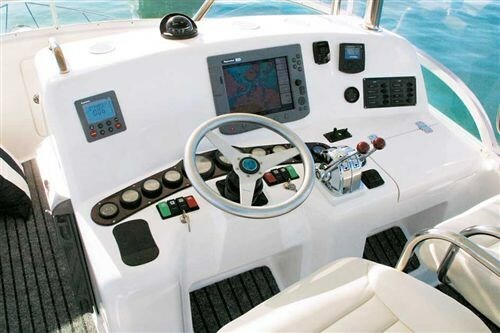 It’s very soft riding, turns tightly and responds nimbly to the helm. Engine noise is remarkably low, despite the twin, 370hp turbo-charged Cummins positioned under the saloon. Multiple engines options are available. Oliver prefers Cummins and Caterpillar engines (together they account for about 90 percent of fit-outs), but its also used Volvos and Yanmars. If you want something other options, they’ll likely oblige but mounting and exhaust changes (at extra cost) may be required. Horsepower choices range from 305 to 390hp. With its twin 370hp Cummins, the review cruised comfortably at 22-24 knots – it exceeds 30 knots fully loaded. Both electrical and mechanical fuel injection is available – electrical offering slightly better efficiency and cleaner running. The engines are mated to twin disk gearboxes driving four-blade Briski propellers. Engines are easily accessible through a hatch just aft of the saloon doors. The bays are painted white, so it’s a well-lit area. Despite space being tight, there’s enough room to maintenance purposes and checking the engines’ service points. Exhausts exit underwater, helping to dampen noise and reduce fumes in the deck areas. Oliver’s design philosophy is "being as comfortable on board as you are at home". Of course, this could never really be the case – unless you actually live on a boat or in an extremely small, oddly-shaped house. Nevertheless, stepping on board, it’s easy to appreciate and accept this in the spirit it’s meant. Definitely roomy for its class, the 370 is littered with the sorts of decadent touches that can leave good impressions – from the leather upholstery and cherry wood cabinetry throughout, down to the subtlety of slightly heavier and better quality stainless steel cleats. The cockpit is a good size, with a combing is high enough for safety but not too high. This boat was equipped with non-slip, doulded GRP flooring, but it’s also available in teak. Clearly, this is a boat that can be ratcheted-up quickly for serious fishing. There are plenty of decent sized lockers, including one by the saloon door, for rods and tackle, and a bait tank on the platform. The rod holders are nicely spaced and set up, and there are toe "kicks" or holes around the inside base of the combing, allowing those fishing to stand closer to the edge. There’s also a reinforced centre for a game chair mount, and the owner of this particular boat had even had a customised fitting made for a barbecue next to the transom door. Access along the sides to the foredeck is relatively easy – the inset steel hand rail is both ergonomic and aesthetically pleasing. Unfortunately, the overall impression is somewhat spoiled by the dinghy mounted on the foredeck – but I guess it’s only there for passages. A 40lb Sarca plough anchor has a 50-metre 8mm galvanised chain controlled by a Maxwell windlass. A bowthruster is optional – but it’s not usually requested with the twin engines which in any event make the 370 very manoeuvrable. 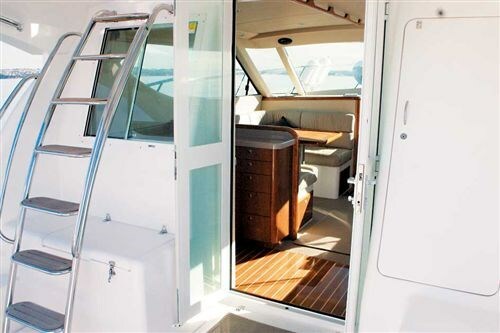 Up the ladder is a comfortable and airy flybridge. Passenger seats line the port side and in front of the helm station – this latter area could do with a bit more leg room. There’s room for two helm seats (the second is optional) and clears can fully enclose the area. The seating layout makes for easy interaction between helm and passengers, and provides unobstructed 360 degree views. There’s also visibility to the cockpit below – through a glass window in the hatch. Controls and electronics can be customised – in fact, there is no "standard". In the review boat the instruments included a Raymarine C120 radar/GPS unit. As a guide, these boats typically have around $20,000 to $30,000 of gear fitted, including radar, GPS, sounding, and auto pilot. Fitting an inverter is largely dependent on whether customers opt for a generator. Going below deck, the quality feel is apparent the moment you enter. The immediate impact is the warm, welcoming sight of wood – on the floor, tables, cupboards, doors and frames. The saloon is fairly conventional in design. It’s light and roomy, with good all round viewing, especially through the front curved window, which is toughened and tinted. The side and aft windows are also tinted and can be opened. One settee is angled around the main dining table; the other settee runs along the side (and doubles as a bed), in front of which there’s a pull-up TV, stereo system and pull-out drinks cabinet. Separate designs allow for forward or aft positioning of the galley; the aft seems to offer better flow and connection to both saloon and cockpit, as in this case. The area makes good use of the space and is fully-equipped – boasting a three-in-one oven/microwave, two hobs, sink and a handsome amount of storage. Across the other side of the door, there’s a fridge and freezer, and switch panel above. With the slide-out settee, the boat’s designed to sleep six in comfort. Three steps lead down to the cabin area. Again, there are option layouts. The 370 is available in "island" double-berth forward cabin, with shower/toilet to port and a two-bunk guest cabin along the starboard side, as reviewed here. The alternative configuration is a "V" four-berth double cabin (which offers a fractionally larger saloon). The master cabin is generous and dominated by a queen size bed and the distinctive headboard mirror, complete with the Oliver Marine logo. Storage is plentiful, both underneath and in hanging lockers either side. The guest cabin has two reasonably sized bunks, and natural light from portholes (which, again, are optional). Indeed, there’s an extensive list of options on the 370, from the basic hull colours, gensets and whether or not you want air conditioning, to the more complicated height of the helm and the position of the canopy. With a price tag starting at around $620,000, the 370 offers a good entry level to the high quality launch scene – or it might also appeal to those coming down in size, but want to retain a certain level of look, feel and performance. Aside from the dinghy gripe, there’s little to criticise. The height of the flybridge and game poles may make it look slightly top heavy, but this is not borne out on the water. One major concern, however, is a lack of a connection port for iPods – Oliver is eager to fix that particular "problem"! "One thing we know about boating," says Doak, "it’s not just about fishing." The 370 exemplifies this approach. For sure, Olivers are proven fishing machines and incorporating the right specifications provides a formidable game fishing craft. 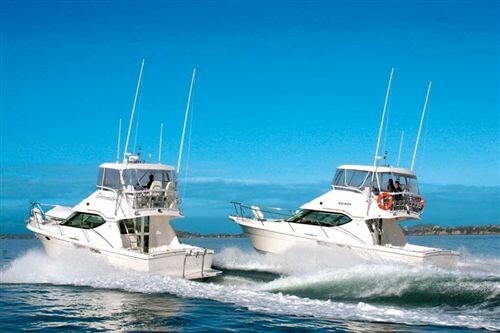 Nevertheless, it’s far from an out-and-out fish finder and the combined performance, attention to detail, and high levels of comfort of the 370 also make it good for family fun – chances are lucky owners will enjoy a little of both.